The new Nest Protect is step #2 in Nest's plans to deliver smart, interconnected household devices that are truly consumer-friendly. The $129 Nest Protect is a super-smart, wifi-enabled smoke and carbon monoxide alarm that creates a wireless network of sensors that can be managed from a computer or smartphone and can even interact with and extend the capabilities of Nest's existing HVAC thermostats. I'm a happy Nest thermostat owner. The $250 price tag means the Nest thermostat is not everyone's cup of tea but I tend to experience a bit of irrational exuberance every time I think of the device despite its cost. I believe this must be akin to what many diehard iPhone fans feel. Happy as I am with my Nest, it was with some level of excitement that on October 8th I read Nest's announcement of the Nest Protect: a wifi-connected smoke and carbon monoxide alarm. Yes! An alarm that sends messages to my phone when smoke is detected or the batteries get low. An alarm that senses movement and activates a temporary night light for the kids' midnight treks to the bathroom. An alarm that lets me silence it with a wave of the hand instead of climbing on a chair to push a button. An alarm that creates a wireless network with other Nest alarms and even the Nest thermostat to combine sensors and work together as a team. Excellent. Except there is a catch for new carbon dioxide detector owners. A rather big catch that Nest doesn't advertise. In fact, prior to a few weeks ago (November 15th), Nest didn't mention it at all: You will need to throw away (recycle?) every $129 Nest Protect device after 7 years of use. Wha??? When I outfit my house with a team of $129, wifi-connected, motion-sensor-enabled smart smoke detectors I rather expect that these will be the LAST detectors I'll ever need to purchase. What gives? Ok, we can't put all the blame on Nest. State regulations generally limit the use of CO (carbon monoxide) detectors to seven years before replacement. CO detector regulations for UL-listed devices have been updated several times since the early 1990's and present regulations specify that, once a detector has reached its "expiration date", the detector must begin emitting an end-of-life signal (beep-beep-beep) and cease performing as a CO detector. Similar regulations state that smoke detectors are to be replaced every 10 years so, even without a CO sensor, the Nest Protect's effective lifespan would still be legally limited. Nest can't really avoid "must replace after seven years" regulations for CO detectors. Nest can, however, be quite a bit more up-front in pointing out this fact. Other manufacturers do just that. 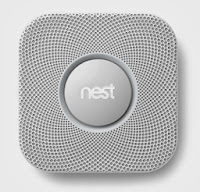 Neither the Nest Protect product page nor the supplimental Nest Protect fact sheet mention the seven year limitation or indicate the inclusion of an "end-of-life-alert" feature -- a feature which *must* be included according to regulations enacted as part of UL 2034 in 2007. Other manufacturers clearly indicate the standard 7-year limitation for CO alarms. In a FAQ entry on the Nest product support pages. You *did* go to the support pages and read all the entries there before buying, right? Via the expiration date printed on the back of the Nest device itsef (i.e., after you've purchased it). Via page 16 of the "General Maintenance" section of the Users Guide. You'd hope this rather crucial piece of information would be included near the start of the guide but, nope, it's down on page 16 following sections on cleaning the Nest, resetting the Nest, replacing batteries, where to send for repair and finally a link to Nest's webpage on recycling -- though to be fair the recycling link *is* conveniently located on the same page as the statement "You will need to replace Nest Protect after 7 years with a brand new Nest Protect." In the "Technical Information" section of the Nest Protect smartphone app and/or web page (i.e., after you've bought and installed the device). You will first need to create an online account with Nest, connect your Nest device(s) and install and configure the app on your phone or use the web interface for your Nest device(s) before you can access the "Technical Information" section and discover that there is a product expiration date. Two weeks before it programmatically ceases to function, the Nest Protect will light up with a yellow light. If you wave at the Nest it will say, "Nest Protect has expired. Replace it now." It would be nice if, after nearly 7 years of use, your trusty Nest Protect devices gave you a bit more warning to start saving up for some new replacements. Perhaps that can be added in a future firmware upgrade. With this initial version of the Protect the Nest developers have chosen to to exclude interoperability with other smoke and CO sensors. Many detectors have a simple, industry-standard communications line (hard-wired line) to allow *all* units to sound an alarm if a single unit detects a threat. This is important if, say, a downstairs sensor detects fire but familiy members are all asleep upstairs and may not easily hear the downstrairs alarm. Would you rather be alerted right away or only after upstairs sensors also detect something amiss? The uber-smart Nest inexplicably does not include this simple wired-trigger option. This means you'll have to go 100% Nest all at once or forgo this feature -- not a nice limitation to discover if you were planning to replace an existing network of sensors one unit at a time. If all your sensors are Nest Protects, however, then there is no worry -- unless the fire started when your wireless router went up in flames, that is. Or unless the fire started while the wireless router was unplugged. Or during a power outage. Oops. Here's a head-scratcher for you security nuts: a networkable device aimed at the high-end consumer segment for use on private home networks that does *not* tell you the device's MAC address. For you non-security nuts, this means you can't use one of the most powerful security features on your home router: "approved" MAC address lists. Network devices are identified with unique MAC addresses and you can usually enable a feature on your home router to limit network access to devices you've specifically approved. You can, for instance, allow *your* iPad to connect but your friend's identical iPad will be denied access even if your friend knows your network name and password. Nest does not print the MAC address on the device or include it with the device's documentation or packaging. Depending on your router you *may* be able to see MAC addresses for all devices attemtpting to connect to your network. If that's the case then you can figure out which MAC address goes with which Nest device by turning each device on/off and seeing what changes on the list. Discovering MAC addresses is not terribly difficult for IT-minded folks but the average consumer will probably be stumped when trying to use Nest Protect on a MAC-address-list-protected network. While most users won't run into this issue, it's odd that Nest does not do much to point out that users are limited to managing no more than 10 Nest Protect devices per account. Nest *does* state this limitation but does so only via a single sentence on this support page and on this support page. No explanation is given for the 10 device limitation. Should I buy? Should I wait? Should I avoid Nest Protect entirely and just be content with my Nest thermostat? The answer will depend on the person. You can get the main smoke and CO detection features for well under $40 in other brands' products including interoperability with multiple devices (wired), voice alerts and sometimes even emergency lighting. You *won't* get a nifty smartphone app or the ability to extend the motion-sensing capability of your Nest thermostat. Another factor to consider is that in 2014 Nest plans to introduce a security product (or perhaps integration with other manufacturer's existing products). Integration between security, thermostat and smoke/CO detection devices could be the determining factor for smarthome-seeking consumers. An even bigger factor for 2014: Nest is opening its thermostat API to developers which has the potential to enable a ton of new options for Nest thermostat owners. If Nest does the same with the Nest Protect then there's the chance that some 3rd party product or app will seriously up the value proposition of a Nest Protect-enabled home. Will I buy into the Nest Protect devices? I think I probably will -- but I may wait a few more months to see how things play out before I commit $129 per device towards the seven year planned obsolescence of CO detectors. amazon for nest protect 2nd gen says "up to 10 years"? Thanks for the added info regarding the battery in the thermostat. That's a great point about Nest not pointing out to customers that there is an internal part which is guaranteed to wear out over time. With the Nest's current programming code, if the power provided by the internal battery drops below 3.6V the Nest will refuse to operate. To be fair, however, the thermostat battery *is* designed to be replaced in Nest v1, v2 and v3. The battery is not hard-wired or soldered into the device. In fact, the various connectors/wires involved in getting to the battery even have simple numbered instructions printed on them regarding the order of dis-assembly. Unfortunately Nest has not made a replacement battery available for purchase (yet?) so replacement would involve finding a similar size and spec battery (3.7 volt 568 mAh) and cutting and reusing the connector from the original battery. Why can't Nest make the smoke and co modules replaceable like swapping out batteries? It is irresponsible to make devices knowing they will end up in the landfill when much of the waste can be avoided by making the parts that wear out replaceable.